I found this video over at NASA this morning. It’s called the 2009 Tour of the Cryosphere. Produced by the Goddard Space Flight Center, it combines the satellite imagery with computer animation to take the viewer on a brief tour of our planet’s frozen regions –- the cryosphere. 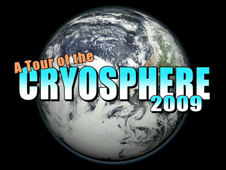 “The Tour of the Cryosphere 2009” combines satellite imagery and state-of-the-art computer animation software to create a fact-filled and visually stunning tour that shows viewers the icy reaches of Antarctica, the glacier-pocked regions along the Andes Mountains, the winter snows of the American West, the drifting expanse of polar sea ice, and the shrinking Jakobshavn glacier in Greenland. The video is in .ASX format which leaves Mac users in the dark so I’ve re-encoded and mirrored it here. It’s a nice piece.